Being a new railroad during a boom period in model railroading benefited Penn Central and the HO enthusiast during the late 1960s and first half of the 1970s. Models present include Lionel’s GP9 no. 5700 pulling Bachmann’s open tri-level auto carrier, as well as TYCO’s F9A with AHM’s wide-vision caboose. The early 1968 official arrival of Penn Central (PC) from Eastern U.S. giants New York Central and Pennsylvania Railroad, and later New Haven had a major impact on North American transportation. By April 1, 1976, Penn Central’s struggling life ended with the U.S. government forming Consolidated Rail Corp. or Conrail from the widespread PC system, as well as other struggling roads in the Northeastern states, such as Erie Lackawanna and Reading. For the hobby of model railroading, what impact did Penn Central make? This HO Collector cover story feature devotes itself to perusing the magazine’s shelves and consulting vintage catalogs and hobby publications to see what was available in 1/87th model trains during the days of Penn Central (1968–1976). This survey will alphabetically review the hobby manufacturers in business at the time and what those companies produced and sold during the Penn Central era. This is not an absolute presentation of all HO Penn Central releases, as that would likely take up more than an entire edition of HO Collector. Only plastic models saw inclusion and foreign manufacturers, such as Fleischmann, were not included. The goal is to provide a starting point for looking over your own collection and hopefully pointing out some gems that you don’t have and maybe were not aware existed. Located in Philadelphia in prime Penn Central country, AHM was a big supporter of the road with a variety of offerings. This group shows a boxed Roco-made widevision caboose with the Rivarossi-tooled 40-foot sliding-door steel boxcar and Kader-made four-bay offset-side open hopper. Associated Hobby Manufacturers (AHM) imported models in various scales from many parts of the world. The late 1960s and 1970s, during Penn Central’s reign, was a successful period for this hobby company. You’ll find Penn Central well represented among AHM offerings. For diesels, AHM offered its Yugoslavian-made Alco RS-2 diesel switcher decorated for Penn Central in powered and non-powered versions. The Fairbanks-Morse C-Liner, in A- and B-unit styles, came in Penn Central with some models including a red “P” interlocked with a white “C” for herald representation, which was not a commonly seen offering at the time. Most likely, the most memorable Penn Central locomotive release from AHM was its GG1 electric locomotive. Debuting in the early 1970s and coming from Rivarossi in Italy, this popular model included a variety of decorations during the 1970s with Penn Central included for this HO release. Though AHM saw fit to produce a Conrail steam locomotive and did New York Central and Pennsylvania Railroad steam locomotive models, there was never a Penn Central steam locomotive from the company. Almost missing the survey, an uncommon Penn Central model to seek out is from American GK Locomotive Works. This hobby company came on the scene in the mid-1970s with HO models for two GE electrics, as well as other releases and some announced diesels that never made it to market. For the PC collector, American GK’s dual-ended E60CP came in powered and non-powered kits. The single-ended E60CF electric was produced in Penn Central livery in the same arrangement. Those electrics reappeared in the Walthers line in the 1980s. Watch for David Otte’s coming feature in HO Collector on these two interesting electrics and the models produced for them. One of the first HO-scale diesel models decorated for Penn Central came from Wisconsin-based American Train & Track (AT&T) in 1969. Though not on the PC’s roster, AT&T sold an Alco Century 415 diesel switcher lettered for Penn Central (AT&T’s #22). AT&T imported this HO C-415 from Mehano in Yugoslavia, which also provided an F9A diesel. AT&T’s F9A road names included Penn Central (#41) wearing black with a large “PC” herald on the back end and road number 9000. American Train & Track and Penn Central were both brand-new companies in the late 1960s and neither was around by mid-1976. AT&T introduced this HO-scale Alco Century 415 to the hobby in 1969 and Penn Central was among the roads offered. Penn Central rostered an amazing variety of diesels, including many Alcos, but the center-cab C-415 was not present in the road’s fleet. New Jersey’s Atlas Tool Co. was long known for its hobby products, but until 1975 that didn’t include motive power or rolling stock. The company imported a group of Electro-Motive Division (EMD) diesels made in Austria by Roco in the mid-1970s. Atlas cataloged its SD35 (#7017) and FP7 (#7047) decorated for Penn Central in 1975 and just after PC’s demise a GP38 (#7066) arrived in 1977 from Atlas. During the period Penn Central was in existence, Athearn was not prolific with production of road names for its HO models. The company practice was to introduce a model and usually the limited number of road names first manufactured would be all that you saw for a particular model with only certain exceptions. Athearn’s selection of road names also in those days frequently showed a Western U.S. road bias, though likely this was based not only on the company’s California-based headquarters but also as much due to the popularity of railroads such as Santa Fe and Union Pacific. Looking for official Athearn models cataloged between 1968 and 1976 and lettered for Penn Central is a challenge. For diesels, only the General Electric (GE) U28C appears during the PC era. Athearn introduced a number of U-boats in the early 1970s (both fourand six-axle versions) and the black Penn Central U28C (#3423 powered and #3433 non-powered) is the only entry for motive power. Penn Central fared better from Athearn with respect to rolling stock. By the end of 1976, Athearn’s catalog included a Penn Central 40-foot outside-braced high-cube boxcar (#1954), 40-foot sliding-door boxcar (#1206), 50-foot plug-door boxcar (#1327), and wide-vision caboose (#5365). 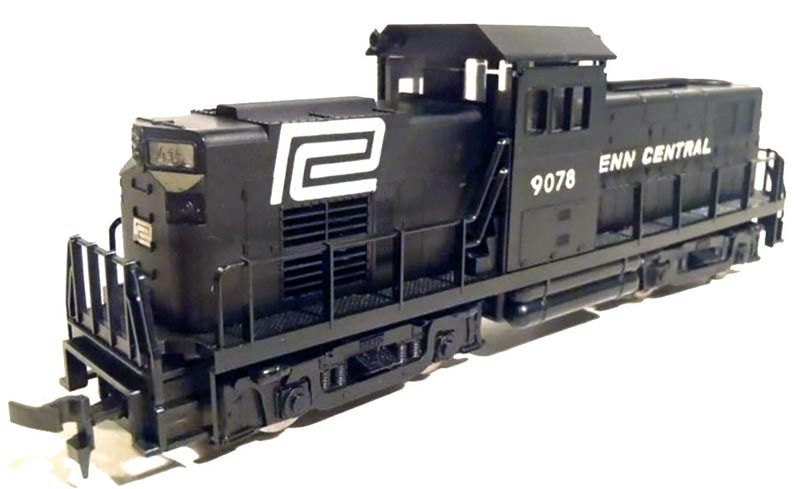 The first plastic model in HO scale for EMD’s popular GP40 came along with the expansions of Bachmann’s line from only offering Plasticville U.S.A. structure kits to a full collection of motive power, rolling stock, track, and more in 1970. This GP40 model remains in Bachmann’s catalog today, but has seen numerous drive, as well as shell revisions during its years of release. Avoiding the Jade Green lure that TYCO couldn’t resist, Bachmann’s early 1970s Penn Central releases provided a pair of diesels with good representations of prototypical decoration. You’ll see Bachmann’s Penn Central GP40 (#561 powered and #581 dummy) present among the model images in this article; the PC F9A (#501 powered and #521 dummy) arrived at the same time as the GP40 in 1970. Bachmann included Penn Central among its HO-scale rolling stock with a 40-foot boxcar, 50-foot plug-door boxcar, standard-cupola caboose (pictured in this article in Bronco packaging), heavy-duty 16-wheel 200-ton flatcar, 50-foot PC flatcar with SeaLand 20-foot containers, 50-foot PC flatcar with Bicentennial containers, pulpwood car (green flat with yellow super structure), 51-foot mechanical reefer, and 85-foot tri-level autorack. Penn Central operated its own passenger trains from its inception in February 1968 until the coming of Amtrak in May 1971. Though many factors led to PC’s failure, its struggles with money-losing passenger trains received much press and helped the U.S. government down the path toward a national service – Amtrak – that relieved most American roads of passenger trains as the 1970s got underway. Jim Conway’s Con-Cor line produced HO-scale passenger car models during the PC era which were among the only ones to feature scale-length bodies in easy-to-assemble plastic kits. Penn Central was represented among those fluted-side streamline passenger car models. You could purchase a baggage (#H748), coach (#H708), dome car (#H718), dining car (#H728), and observation (#H738) by 1971. Those HO-scale Con-Cor passenger car kits sold for $4.98–$5.98. Penn Central releases came molded in silver with Jade Green letter boards with white speed lettering in appropriate typeface. Releases for Penn Central models were plentiful during the road’s eight-year existence, but many took liberties with design and application. Lionel’s mid-1970s GP9 (left) was a fairly respectable effort, as was Bachmann’s early 1970s GP40 (right) decorated for Penn Central. TYCO’s use of a Jade Green-hue (middle) on its F9A and other locomotives was colorful, but not prototypical of the road. Though Athearn made one, you couldn’t buy a Penn Central F7A from that manufacturer in the early 1970s. For its first few years, Cox marketed HO-scale model trains produced by Athearn in California. Among the Cox offerings, you had access to assembled versions of many items also in Athearn’s product line, but there were some exceptions. Collectors will point to the black with white lettering Cox F7A decorated for Penn Central (Cox #61 1040) as an uncommon example of that common tooling. 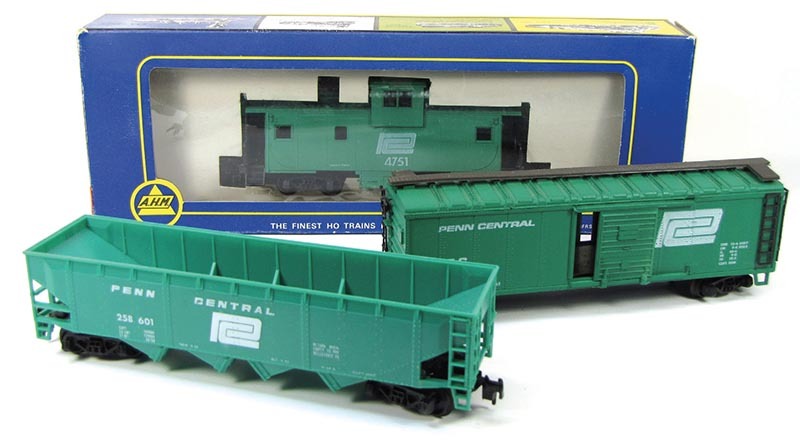 Cox cataloged its Penn Central F7A in the “Fast Freight Special” train set that included a green PC caboose. Cox’s “High Road Special” set came in Penn Central and provided matching F7A and F7B diesels. Cox lists its Penn Central F7B (#61 1050) as a non-powered diesel model, available separately, as was the powered PC F7A. The green Penn Central standard caboose (#61 7110) is also thought to be exclusive to Cox’s catalog during the 1970s. The other Penn Central diesel in Cox’s early 1970s line was Athearn’s General Electric U28C diesel. You could obtain this six-axle U-boat in the company’s “Transcontinental Highball Freight” train set in Penn Central dress, as well as separately (#61 1320) as a Cox-packaged powered U28C release. When Cox moved its production to Hong Kong in the mid-1970s, Penn Central offerings disappeared from the line. Early 1970 brings Life-Like’s HO expansion with the acquisition of Gordon Varney’s line of products. Penn Central models present in the first half of the 1970s for Life-Like include a GG1, EMD F7A (using tooling originally serving in the Penn Line catalog), and an Alco RS-11 (which appeared briefly from Varney before going to Life-Like). Following AT&T’s departure from the market, Life-Like imports some of the same models AT&T cataloged. Those include a Penn Central F9A (#T233-G) and Century 415 (#T237C). For its second time in the HO market (1974–1977), Lionel included a black Penn Central GP9 among its motive power offerings. 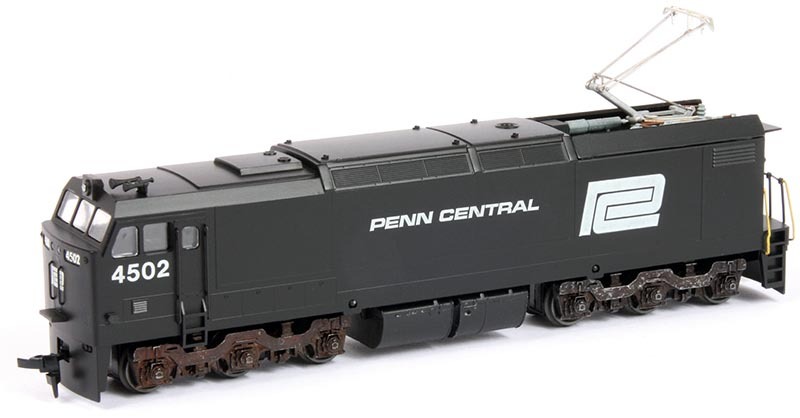 This GP9 represents the only known Penn Central item in the Lionel HO catalog for this period. The company’s GP30, produced by Kader, would have made a good PC release, but the road wasn’t included in Lionel’s line. You will see a Conrail GP30 on the cover of Lionel’s 1977 catalog. A fantasy EMD FP45 made for Model Power by Lima. An interesting piece of vintage HO for the collector is the Lima-made FP45 decorated for Penn Central. Model Power sold this diesel model under its PMI subsidiary in the early to mid- 1970s. Somewhat surprisingly, Model Power didn’t include Penn Central in the group of 1972 Baldwin Sharknose diesels. Penn Central also missed appearances for Model Power’s Alco FAs, E7A, and E9A diesel models in the early 1970s. Now part of the Horizon Hobby family with Athearn, during the Penn Central era, Model Die Casting/ Roundhouse was its own company and based in Hawthorne, Calif. While its collection of HO-scale freight cars might not always have matched up to contemporary prototypes, you’ll find that Roundhouse often was an early adopter of many new road names. Penn Central was welcomed into Roundhouse’s catalog in 1968 and those kits mark some of the very first HOscale PC offerings. Collectors of Penn Central items from the Roundhouse line can look for a 40-foot Superior door boxcar (#B 46), Pullman-Standard PS-2 two-bay covered hopper (#H 42), 50-foot plug-door boxcar (#B 60), center-cupola caboose (#C 41), rectangular-side ore car (#H 26), and 40-foot gondola (#G 49). Roundhouse’s 50-foot sliding-door boxcar came in green with a small “PC” herald and Pittsburgh & Lake Erie subsidiary lettering (#1205), as well as a then-rare example of the red-and-white “PC” worms herald (#1208), which didn’t find a great deal of application between 1968 and 1976 for HO models. Generally, once a hobby company set up a design for a model during the Penn Central era, that same version remained around without alteration. Check out TYCO’s Alco Century 430 diesels decorated for Penn Central. The road number “4301” was standard issue for these Alco diesel models, but there are at least two variations (typeface and color) for 4301-numbered examples. The Century 430 wearing the GP20’s usual “5628” road number is equally curious and presents another version for collectors to locate. During the years of Penn Central, TYCO promoted itself as the world’s largest manufacturer of HO-scale electric trains. The company didn’t miss out on producing its products in Penn Central versions. Among its diesels, TYCO produced nearly everything in its line of the time decorated in some form of Penn Central dress. This article provides images of examples showing variations in the application of lettering, road number, and “PC” herald; however, one thing was a constant with TYCO’s efforts… Jade Green was the color of choice for Penn Central releases. You could buy TYCO Penn Central F9A (#224R powered and #225R dummy), F9B (#230R dummy only), F9A and F9B set (#240R), GP20s (#228L), Century 430 (#235G), and the diesel switcher (#241A). TYCO also produced PC rolling stock, including streamline passenger cars. TYCO’s designers never seemed satisfied with lettering for Penn Central models. The company’s green F9s, Century 430s, and these GP20s all saw more than one attempt. Molded in color, these GP20s look to be of slightly different shades of green, in addition to wearing different PC decoration. You might think Varney was gone from the hobby before Penn Central arrived, but that’s not the case! Near the end of its long run in the hobby, Varney adds a Penn Central F7 to its line in 1969. That same year, the first appearance for a Yugoslavian-made Alco RS-11 model debuts in Varney’s catalog and Penn Central is one of three road names offered. You’ll find the black Penn Central RS-11 as the power for Varney’s 1969 “Big Hook” train set release. The Walthers you know and enjoy today was a much different hobby company during the Penn Central era. Walthers didn’t begin producing HO scale plastic freight car kits largely until the mid-1980s. In the late 1960s and 1970s, Walthers offered wood-and-metal kits for passenger cars, doodlebug motor cars, and some traction prototypes. 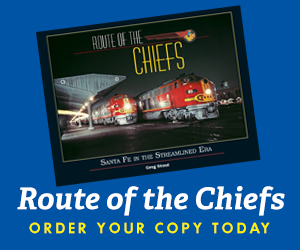 The company did produce decals during the PC era and these releases… one in particular… will be what many will likely remember, when you mention Walthers and Penn Central. 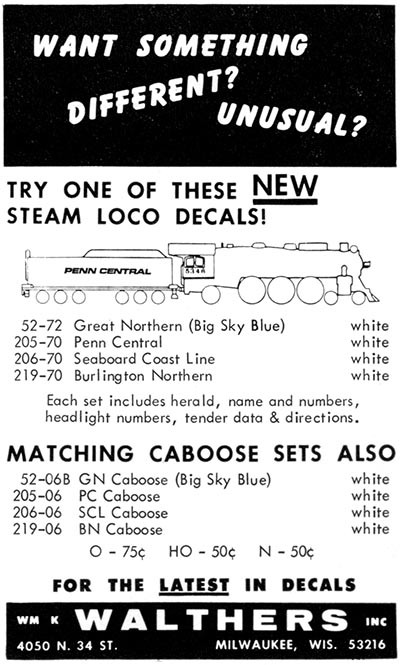 In 1970, Walthers produced a series of decals featuring Burlington Northern, Great Northern, Penn Central (#205-70), and Seaboard Coast Line. The decals provided white lettering and came in two sets (locomotive and caboose). Why, would these 1970-issued Walthers decals be memorable? The locomotive sets were for steam locomotives and the era presented for the sets dated back only to the late 1960s… Well after regular steam operations had concluded. The only road in the group to have owned and operated steam locomotives in regular service was Great Northern and that set was the late 1960s “Big Sky Blue” livery. For February 1971’s MR, then-head of the hobby manufacturer/distributor, Bruce Walthers, replies with a full-page defense of the decals in question. In Mr. Walthers’ comments, you’ll read the company is, “not above promoting pure hobby fun and tongue-in-cheek humor.” A Gil Reid illustration running across the lower portion of the page presents a steam locomotive hustling toward a bridge signal. The tender on the steam locomotive sports a large white “PC” herald (with 64 rivets inside the herald… yes, your authors counted the rivets!). Today’s collector of HO enjoys an amazing number of highly accurate Penn Central models. 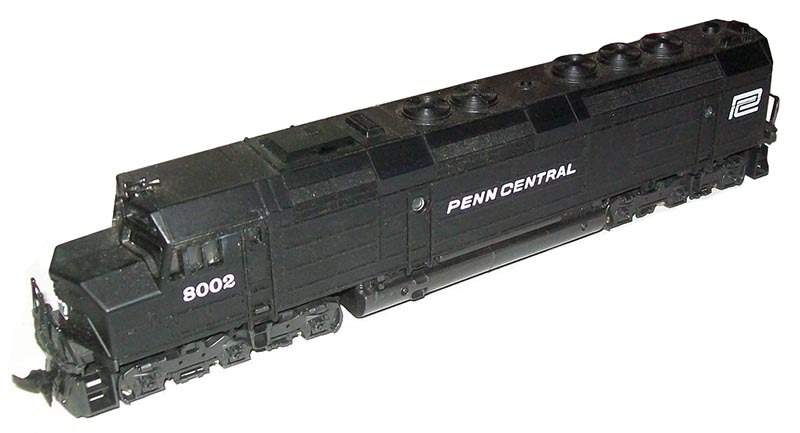 These contemporary Penn Central HOscale releases from companies such as Athearn, Bowser, Moloco Trains, Tangent Scale Models, and others serve as examples of the excellent level of quality provided today that will doubtless be future collector’s items. This article appeared in the 2018-1 issue of HO Collector!